The Children’s Garden is located right behind the Brig building, and across the street from the Playground Area! 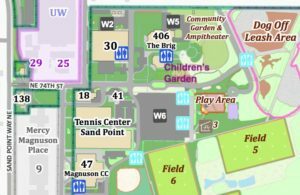 From the Playground, the Children’s Garden is super easy to find: Walk north on the sidewalk, then cross NE 74th St. at the 4-way stop. Take a few more steps down the sidewalk, then look on your left for the giant mosaic eyes and tail of the Grey Whale Garden! Arriving by car: The main entrance to Magnuson Park is at the intersection of Sand Point Way NE and NE 74th St. The Children’s Garden is 3 blocks east of this entrance, and the closest parking is in the W-6 lot. Arriving by bus: Bus routes #62 and #75 stop at the intersection of Sand Point Way NE and NE 74th St, which is the main entrance to Magnuson Park. The #74 Express, which runs during rush hours only, also stops at the park entrance. The Children’s Garden is a quick, 3-block walk east of this entrance. Arriving by bicycle: Enter Magnuson Park at the Sand Point Way NE and NE 65th St. entrance (There is a protected bike lane from the Burke-Gilman trail to this intersection). 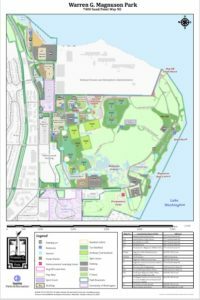 Once you enter the park, the safest route is to ride down NE 65th St and take the second left turn at Sportsfield Drive, then ride north to the first 4-way stop. You can park securely at the bike rack in front of the Playground or at the rack in front of the Brig building.